Summer is the perfect time to spend your holiday with us. In close proximity of the Großglockner Hochalpenstraße you can expect an comfortable, familiar timeout. No matter if you are jumping into the Zeller lake or the swimming pool in Fusch, visiting the wild animal park, making a trip by ship or hiking - there is nothing standing in the way to a perfect holiday in the Unterkrämerhof! All guests get the free Holidy Bonus Card, included in our hotel price. 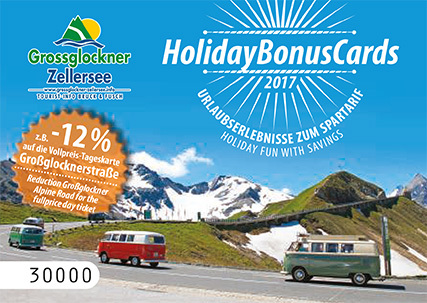 A coupon booklet with 37 touristical offers which are reduced or free. Wild animal zoo Ferleiten – evening entrance starting from 05:00 p.m.